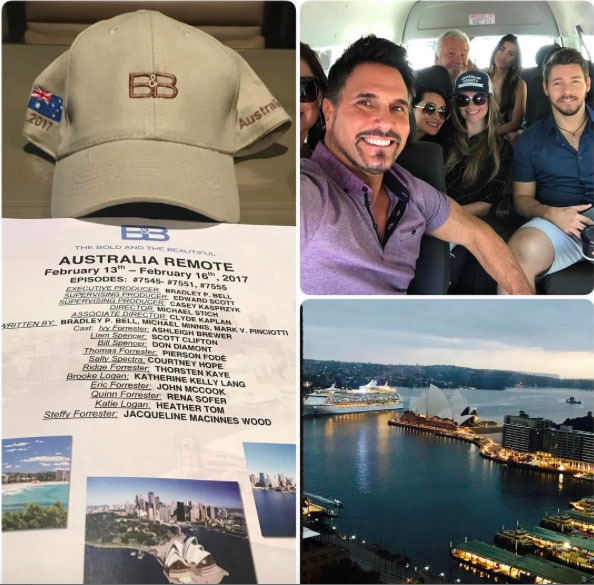 The Bold and the Beautiful cast who went down under had fun in the traveling too. Photo courtesy of Instagram. Based on their Instagram posts, the Bold and the Beautiful cast members who went to Australia to film some special episodes even managed to make saying goodbye and flying home fun! Don Diamont (Bill Spencer) got himself ready for the return the the bump and grind in LA in a special way. Scroll down to see his post and those of his cast members. His cast mate, Pierson Fode (Thomas Forrester) took a shot as exciting as the whole trip seems to have been, as his swan song pic in the Land Down Under. Rena Sofer (Quinn Forrester) snapped a pic of costar Heather Tom (Katie Logan) on what she described as the “best” final 24-hours of a trip. While waiting to board their Qantas flight back to LA, and once on the plane, the cast members had fun too! Cast newcomer Courtney Hope (Sally Spectra) noted how massages in the first class lounge made her and two fellow Bold and the Beautiful (B&B) ladies feel pre-takeoff in a colorful shot. Tom, meanwhile, noted that home life might require a little adjusting to after all the pampering they received on their trip, even in the air. And finally, Katherine Kelly Lang (Brooke Logan) documented how she and Jacqueline MacInnes Wood (Steffy Forrester) made sure everyone landed in LA safely. The end of a hard cardio workout before heading to the airport. Great last day Down Under doing @familyfeudau . @grantdenyer you kill it! Then a fantastic dinner at Nobu courtesy of the one and only @bradleybell ! An incredible location shoot with @boldandbeautifulcbs . All of you guys are outstanding! Thanks for everything!